The numbering of the streets makes it simple to travel around Chicago and the city is laid out in an organized criss-cross grid network of streets, avenues and blocks. 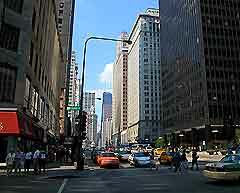 The heart of the city is at the corner of State and Madison Streets in downtown Chicago and many of the city's addresses reference that point, North, South, East or West. Each of the blocks in central Chicago is equivalent to around 100 address numbers and so if an address in 600 North State Street, you would have to travel around six blocks north of Madison Street. 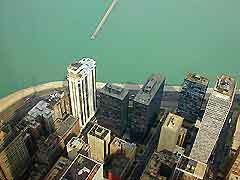 Lake Michigan is situated to the east of the city and the lakefront area has been well developed for public use. Close to Lake Michigan is a large parkland, with beaches, gardens, recreational areas and a number of Chicago's museums. If you travel to the west of Lake Michigan you will reach downtown, with many of the largest shops, hotels and tall skyscrapers, making up the famous skyline. The north, west and south areas of Chicago are mainly residential, with many diverse and interesting neighborhoods, including Beverly, Bridgeport, Hyde Park, Lincoln Park and Roger Park. When you travel further outside of the city, you will reach the suburbs and outer areas of Chicago, which are mainly residential areas, with some shopping malls, businesses, restaurants and hotels. Each suburb may use its own street numbering system, although most follow the city's convention. 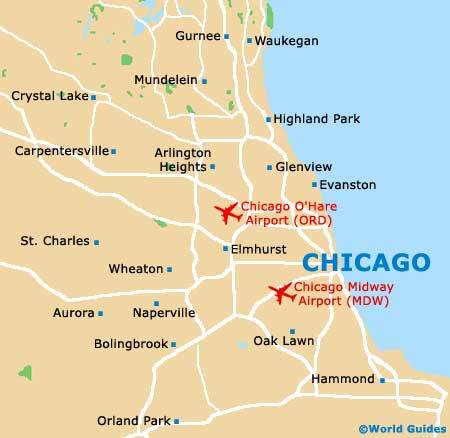 Two major airports serve the region of Chicago - O'Hare Airport (ORD) and Midway Airport (MDW). Major airlines at the airports offer the greatest number of departures, whereas smaller airlines offer low-cost, no-frill airlines with a more limited number of flights arriving and departing from Chicago's airports. Chicago is easy to reach by car and Highway I-90 is a major road that travels straight into the center, from as far away as Seattle. To the east, Highway I-80 travels from New York and from the south, Highway I-55 travels from St. Louis. Driving to and from Chicago is often very scenic and the journey is usually fairly easy. There are numerous large underground parking garages in the city, particularly around the Grant Park area, although these can prove expensive. Cheaper on-street parking in Chicago is an alternative, but is often difficult to find. If you plan to travel outside of the city and explore the surrounding area, hiring a car is an excellent method of transport and is highly recommended. Book your Chicago ORD Car Rental here. Chicago is well pedestrianized and one of the best ways to travel around is by foot. This is an excellent way to see some of the city's numerous tourist attractions and sights. If you have a map, finding your way around the city center is very straightforward and many of the cities major sights and attractions are within easy walking distance of each other. Bus stops in the city are clearly marked with signs indicating the bus routes that they travel along. Operated by the Chicago Transit Authority (CTA) the Chicago buses are a convenient and inexpensive method of public transport. The buses travel throughout the city and the suburbs at regular intervals, around every 10 to 15 minutes during the day and less frequently at night. The elevated train service is often referred to simply as the 'El' and provide one of the quickest ways to travel from O'Hare Airport and Midway Airport into downtown Chicago. There is also a network of commuter trains, known as the 'Metra', and these trains travel to Chicago's suburbs and nearby areas. Taxi cabs in Chicago are one of the most convenient ways to travel around the city and can be easily hailed from the sidewalk in the city center. Alternatively, in quieter areas of the city, taxis can be ordered by telephone and there are a number of reputable taxi firms that your hotel can recommend. The taxi cab meter is always set so that the cost of the first mile is fixed and then each additional mile is then charged at a slightly cheaper rate. Additional charges are often made for luggage, travel late at night, additional passengers and travel on public holidays. Bicycles are a popular way to travel around recreational areas of Chicago and in particular, along the front of Lake Michigan. Cycling is a fast and inexpensive way to travel around and there are a number of bicycle rental shops available in the city, in particular at Lincoln Park.